"Squiggly Squirrel" loves to gather nuts and acorns from the trees in the big park. She is also a good friend of Meowmin. 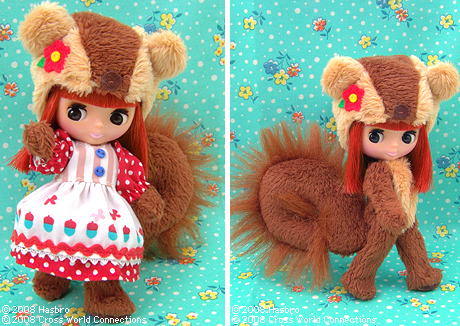 Her squirrel outfit comes with a cute squirrel tail. 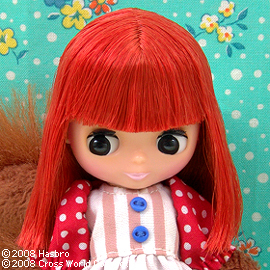 She has straight, shoulder length, vermilion hair with straight bands. She comes with a cute little dress adorned by polka dots and acorns!Her skin is standard color. She wears brown eyeshadow, light pink lipstick, and rosy pink blush. Her black eyes are curiously look to the left.